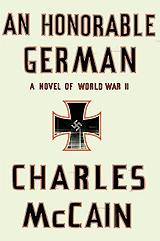 Turbula - Culture - Book review: "An Honorable German"
Hewing closely to the historical record, but telling that history through the form of a novel, Charles McCain's debut novel is a fast-moving story of a Kriegsmarine officer who doesn't much like the Nazis but feels compelled to fight for his country. Seen through the eyes of the fictionarl Max Brekendorf, "An Honorable German" takes us from the early days of World War II as Brekendorf serves on the Graf Spee up through the fall of 1943, with the narrator transferred to service in the U-Boat fleet. In between are trips home to Germany, and an ending that involves Max being held stateside in a POW camp. There's a love story, of course, and evil SS troops. McCain has done a nice job of capturing the feeling of the 1940s. Written in English for a English-speaking audience, McCain's dialogue has the feel of a period movie. His characters speak with the meter and rhythm of that age, and it gives the book a nice, authentic patina. What makes the book more rewarding than a run of the mill novel, at least for buffs of military history, is the way McCain tries to capture what it must have been like to have been a loyal, patriotic German whose nation was being run by a sociopath. And what McCain hints at is that for even the most obstinate German, the bombing raids by the Allies must have sheared away the propoganda and made clear that Germany had no chance of winning a war it had launched. That insight, combined with a nicely paced story with lots of drama, makes for a solid summer beach read.